I used Snapfish to print my photos. If you plan on hanging your blocks with nails, you will want to hammer in your hook before starting this project. I recommend that you use removable velcro hangers instead though. They won’t hurt your walls and your art will hang flat. Paint the edges of your wooden blocks. Don’t worry if you get paint on the flat sides since one side will face the wall and the photo will cover up the other. Once the paint is dry, apply a thin layer of decoupage to the block and then place your photo. When your photo is in the desired position, let it dry flat. 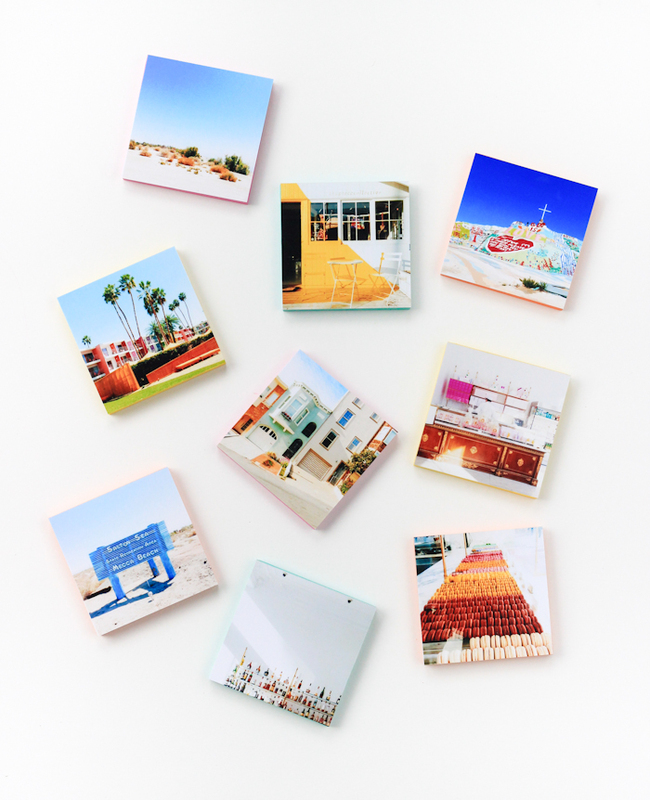 Hang on your wall in a grid, shape, or any way you like! Easy peasy, don’t you think? man oh man how I love this! They look gorgeous! So easy to make with such great results! I LOVE this! There are definitely a few instagram photos I wouldn’t mind hanging up, especially if it looks this pretty all together! This is seriously, sincerely awesome! The color accents are just perfect. L.O.V.E. I love the pops of color, and it really would be so nice to get some of my pictures off the internet and onto the wall. Beautiful! Thank you Lindsay! This project almost makes me want to start scrapbooking. There’s something so nice about be able to hold your photos. How fun! I’m sorely in need of wall art. Great inspiration. Oh then this is perfect Natalie! You could even do it with larger prints if you were looking to really fill up a wall. So fun! I love how you used your brand colors, too (of course!). Such a wonderful idea and your photos are gorg as usual! You are such a dear Laurel, thank you! I love how you painted the sides! So pretty! I not only love, love, love this DIY but your photos are fabulous!! So colorful! That is just so nice of you to say! Thank you so much dear! Peerrrrrrrfection as always!!!! I love how these turned out! This is easy and much more affordable than printing on a canvas. Where did you get the wooden blocks? Oh Creative Day sent me over here. This is such a cool idea. I’m just about to make magnets with the instagram photo cards I got from Social Prints but now I want to do this too!!! This is a FABULOUS idea!! I love that you used wood blocks for this project. So clever! The colors you used are STUNNING. I need to look through my photos now to see what I can duplicate to create something like this. Thank you for the inspiration! I’m not big on color in my room but even a black and white version of this would look so chic. Love this DIY and so easy!